Capers are these funny looking small pearls that you see so often in Mediterranean dishes. They add a little complexity to your dish; salt and brine and the mouth feel. One of the recipes it is use in is Chicken Piccata. Capers are the unripened flower buds of Capparis spinosa and picked during the months of June, July and August. 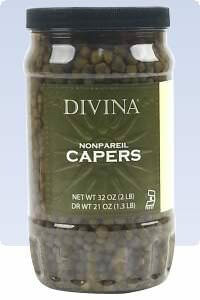 Capers are categorized and sold by their size, with the smallest sizes being the most desirable: Non-pareil (up to 7 mm).